The Undercliff Walk between Black Rock and Saltdean. is currently open. The walk is 5km long. These cliffs are made up of chalk with isolated flints and flint bands. The chalk was laid down in a warm ocean over 85,000,000 years ago. For a full description of the geology of the cliffs please refer to the Geology page. 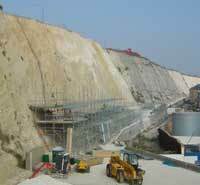 Following a series of cliff falls in the Winter of 2000/2001 the council looked at ways of preventing further large scale falls so that the Undercliff Walk could be safely reopened and the future of the A259 safeguarded. As the cliffs are protected by a number of designations, including Site of Special Scientific Interest (SSSI), it was necessary to discuss the proposals with Natural England. The expert geotechnical advice that the council received identified 2 areas where physical restraint of the cliffs was necessary. Other areas only required trimming of loose areas of chalk and the construction of shingle beds on the Undercliff Walk to catch smaller falls of chalk and flint. 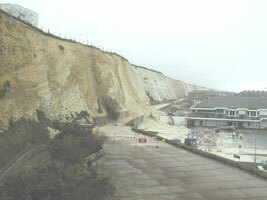 The first stabilisation scheme was completed in 2002 behind the Marina (between Asda and the Mariner's Quay flats). This scheme comprised re-profiling of the top 7 metres, rock bolting and a steel mesh fixed over the face. The second scheme was to address the stability of the cliffs above Asda. This section of cliffs is not made up of chalk but of an ancient beach material (sandy and chalky with fossil remains) and is consequently very unusual. Natural England viewed the geological value of the site as very high and were unable to support the council's proposals. Their objections to this second scheme led to a public inquiry which was held in January 2004. The Secretary of State's decision allowed the scheme but with modifications. The initial proposal was for a pattern of soil nails with mesh over the face similar to the first scheme, as a result of the public inquiry the scheme was approved but without the mesh. Before the works began the council paid for and helped to facilitate a full survey of the affected section of cliff face, carried out on behalf of Natural England by the University of Brighton. This is the first time the cliff has been properly surveyed and sampled since its unique value was identified nearly 200 years ago. Following completion of the works a full and detailed risk assessment was carried out. The results were reported to the council's Environment committee on 26 July 2006. 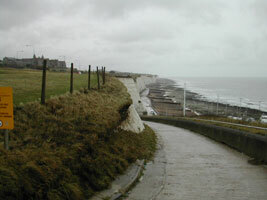 Councillors voted to reopen the Undercliff Walk. 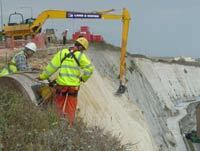 On Friday 28 July the Undercliff was reopened. The cliffs throughout their length will of course continue to experience periods of instability often linked to the weather so there will be times when sections of the Undercliff Walk will have to be closed. We monitor this natural cliff evolution and promote and support research to help us understand how the cliffs are changing and to maintain safety for everyone around the cliffs. Erection of scaffolding up the cliff face. The scaffolding was then used as a platform for drilling soil nails into place. Two abseilors and a drilling rig suspended down the cliff face. This was to carry out initial drilling for test nails before the scaffolding went up. 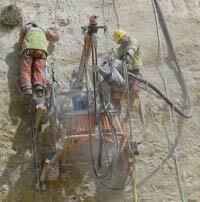 A long reach excavator trimming the top section of the cliff.